Sorry it's a bit blurry! I recently have received my wedding dress that I ordered from lightinthebox.com. First off, I initially order my flower girl dress and shoes from there to make sure the quality was good and what I asked for was what I'd receive. My flower girl dress was Sage, with pink flowers. It was BEAUTIFUL! My little flower girl LOVES it and it looks good. The Quality is good and from my eyes, I see nothing wrong with it. So I went ahead and ordered my gown. I received it a little less than 3 weeks later in the exact color and dress I wanted. The only issue I had with it, was the sizing but I did custom sizing and added a few inches so it was okay to be big... Overall, I was VERY pleased with their website and will be getting all my bridesmaid dresses from there. I highly recommend it if you are looking for a cheap good quality dress for your special day! 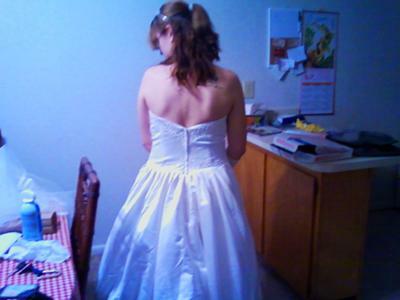 Thanks for taking the time to tell us about your experience purchasing your gown with Lightinthebox.com. I'm sure this will help other brides who are thinking about ordering a wedding dress from them.